Nearly fifty-one years after the explosion, Bea Walls (now deceased) said she shivered outside near the mine, waiting for news – any news about her father, Joseph Koch, Sr. trapped inside. Joseph Koch left for work early on the morning of March 25, 1947. 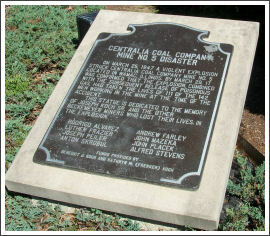 He rode the 40 miles with many other men from the Village of Beckemeyer to the Centralia Coal Mine Company No. 5 in Wamac, Illinois. Later that day, a violent explosion rocked the mine, trapping it’s victims in the rubble. Families waited outside for days for any hope that their loved ones would be pulled out alive. By March 29th, only 31 of the 142 men working in the mine were confirmed still alive. Joseph Koch and eight other Beckemeyer men had died. When the bodies were discovered, Koch’s was found kneeling, praying along with several other men. Rodrigo Alveraz, Luther Frazier, Joseph Peiler, Anton Skrobul, Andrew Farley, John Mazeka, John Placek and Alfred Stevens were the other Beckemeyer residents killed in the mine. Decades later, Benedict (son of Joseph Koch) and his wife, Kathryn were vacationing in Wyoming when they saw a statue commemorating coal miners. It gave him a powerful idea, a way to remember his father and also to commemorate the Beckemeyer men’s deaths and give them some meaning. When Benedict returned to Germantown, Illinois, he commissioned a bronze statue of his father and bought a small piece of land in Beckemeyer. Using a photo more than half a century old, the designer created an amazing likeness of Joseph Koch in both body and countenance. John Placek’s family offered his lunch bucket to the designer for authentic reproduction. 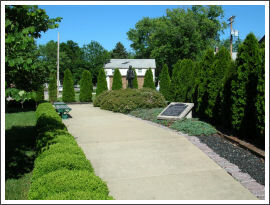 The statue and park were ready for dedication in 1997. On September 21st, nearly half a century and six months to the day of the explosion, a small ceremony was held in Beckemeyer to open the park to the public. Five of Joseph and Elizabeth Koch’s children were at the dedication ceremony: Bernard Koch of Yuba City, CA, Marcella Knapp of Beckemeyer, IL, Bea Walls of Cuba, MO, Benedict Koch of Germantown, IL and Cornelia Sorrell of St. Louis, MO. Unable to attend was Dorothy Wrasmann of Carlyle, IL. To this day, the family of Joseph Koch still get tears in their eyes when they thinks of their father’s life, as well as all those others, cut short by inadequate safety guidelines. Maybe the only good thing which can be said about the accident and other like it is that they forced mining companies to take a closer look at working conditions and safeguards for their employees. 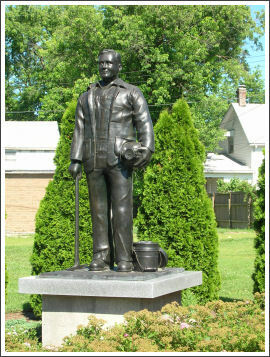 The Coal Miner Monument is located on Louis Street, next to the American Legion.